York have signed former Wales Under-21 midfielder Steve Thomas, after he impressed during a trial spell. The 26-year-old recently reached a financial statement with his previous club Darlington, for whom he had made just seven appearances this season. 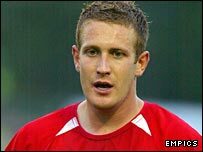 Thomas was born in Hartlepool but began his career with Wrexham, making 115 appearances in a seven-year spell before moving to Darlington in 2004. He won five Under-21 caps, qualifying for Wales through his father.